Yup, it’s that time of year again. Skippy Hallow 2. Still hate Halloween. Can’t get enough of television hosts tarting up in pretend-brity costumes. Even more fun is flashbacks of their silly dressing in drag of years past. News? Shmews. The tacky tradition started in Scotland with ‘guising’, kids disguising themselves on All Hallow’s Eve so evil spirits wouldn’t recognize them. Here’s the 411. They know who you are. 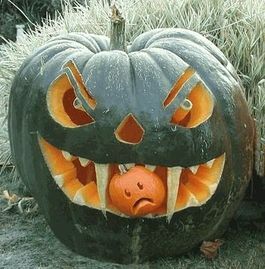 As a witch, I predict this year, Grumpkin Goop. SnowySquashySoup.